Have you ever wanted to make a quilt but couldn't find just what you had in mind? The editors of Quilter's World magazine have compiled some block patterns, from the thousands of traditional blocks available, that you can download for free. With a few basic skills and a variety of block patterns, you can create countless designs in no time. A new 8" x 8" finished block will be available each month along with helpful hints, tips and tricks. We will also give you ideas for block combinations and possible quilt settings from time to time to help you create fabulous quilted projects. We hope these blocks will inspire you to experiment with quilt design and create your own layouts. So get a binder and some page protectors to fill with block patterns and samples to fuel your creative juices. Cut 2 (5 1/4") squares. 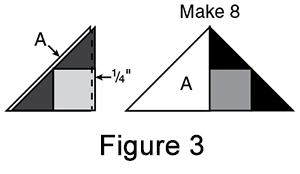 Subcut each square on both diagonals to make 8 A triangles. Cut 8 (2") B squares. Cut 4 (3 1/4") squares. Subcut each square on both diagonals to make 16 C triangles. 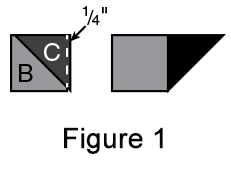 Stitch a C triangle to one side of a B square (Figure 1). 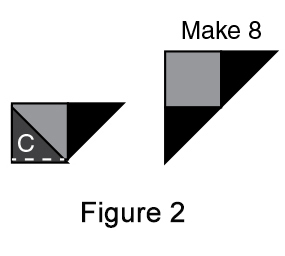 Press seam toward C.
Stitch a second C triangle on the adjoining side of B (Figure 2) and press seam toward C.
Repeat steps 1 and 2 to make eight B-C units referring again to Figure 2. 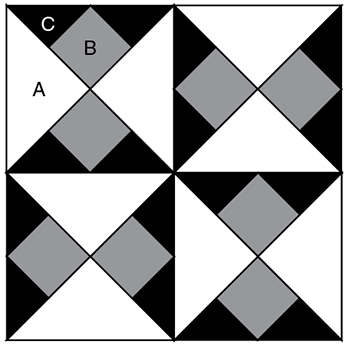 Stitch A and B-C unit together along a straightedge (Figure 3); press seam toward A. Repeat to make eight half-square units. 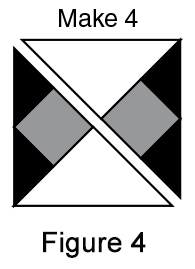 Stitch half-square units together along long edge (Figure 4); press seam toward one side. 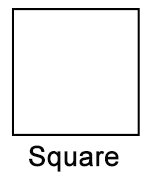 Repeat to make four block quadrants. 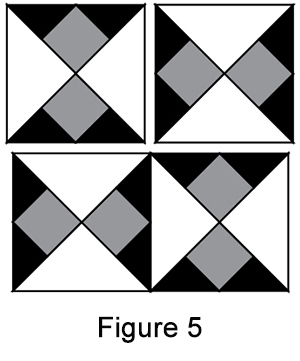 Stitch quadrants together into two rows referring to Figure 5; press seams open or toward one side to complete the block. Choose one each light, medium and dark fabric for this block. Use scraps from other projects, or purchase fat eighths (9" x 22") or fat quarters (18" x 22") to make one sample block. Cut individual pieces from scraps, or cut strips and then individual pieces from strips if using yardage or large pieces of fabric. For example, to cut several 2 1/2" squares, cut a 2 1/2"-wide strip the width of the fabric. Subcut the strip into 2 1/2" squares. Use a 1/4"-wide seam allowance for all seams and stitch right sides together. Use common sense and press seams to cut down on bulk. Traditionally, quilters press seams toward the darker fabric. However, some blocks may benefit from pressing seams open. Pressing tips are often given in the pattern. For more detailed help with quilting techniques, go to QuiltersWorld.com and choose Stitch Guide in the sidebar to access Quilting Basics or consult a complete quilting guide. Your local library will probably have several on hand that you can review before purchasing one. Choose different light, medium and dark fabrics in each quadrant of the block. Remake this block completely by assembling the quadrants so that the A triangles match. When stitched together the blocks will make a string of on-point squares, like a string of Christmas lights or summer lanterns! Consult a complete quilting guide for ideas on how to do any of these things. If you are a first-time quilter you can learn the whole quilting process from Learn to Make a Quilt From Start to Finish by Carolyn S. Vagts, editor of Quilter's World, available at AnniesCraftStore.com. If you are a sometime quilter who needs a little refreshing of your skills, again consult a complete quilting guide (easily found at your local library, book or fabric store) or the Stitch Guide link at the Quilter's World website. Copyright © 2016 Annie's. All rights reserved. For more detailed help with quilting techniques, view our Quilting Lessons or consult a complete quilting guide. Your local library will probably have several on hand that you can review before purchasing one.